In January, 2018, I took a wintersession course at RISD called Nothing But Flowers, which was a class offered to undergraduate and graduate students focused on landscape architecture theory. The course was an investigation of nature from a philosophical standpoint, specifically in relation to ecology and landscape. The final project was a personal investigation of the concept of nature, as well as a response to various theorists covered in the class. My project, Park Garage, was an imagined public space that could address some of these issues in both a practical and conceptual way. Nature Definition: The objective reality that exists beyond our subjectively constructed world. Nature is a cultural construct until interacted with or experienced. In order to create a society that engages with environments in ecologically-conscious ways, we must do away with the subject-object relationship that has come to define our interaction and understanding of nature. Landscapes must be designed in self-conscious ways so that the individual within the landscape can become equally self conscious. In other words, the landscape (and context it exists within) must call attention to the individual’s own role within a relationship. Park Garage is an attempt to satisfy these criteria in the form of an urban public space. It would involve the reappropriation of a city parking garage, which would be transformed into a park/building hybrid. The experience would be defined by the sequence and transition between levels of the garage. 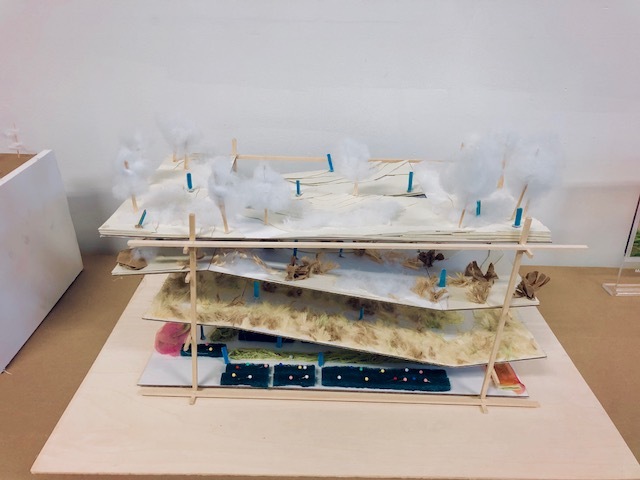 Each level will contain a simulated natural landscape, with the ground floor being an organized garden/nursery, to the top floor being a simulation of a forested highland. The transition would allow visitors to move from a “nature” that is distinctly separate from the individual, to one that becomes a continuation of the individual when actively interacted with. Allowing individuals to reflect on their relationship with the space, the layout would contribute to cultural awareness of nature as something that is not a static, separate entity, but a present reality that we reveal through active experience rather than passive observation. 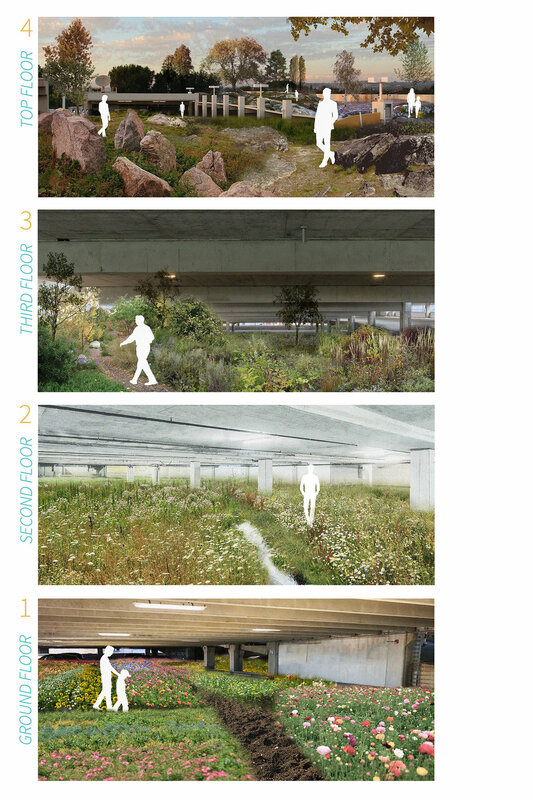 The concept of the Park Garage was originally inspired by James Corner’s definition of “culturally animate ecology,” and his idea regarding the function of a landscape (particularly within an urban environment) as a landschaft. The space was conceived as a way of introducing a new and innovative way to actively engage with the city. Park Garage functions primarily as a piece of land art, aimed at questioning the reality of environment and the cultural aspects of nature. It was largely a response to Olafur Eliasson’s concept of the “authorship of reality”–specifically in his 2014 land art exhibit, Riverbed. Eliasson creates artificial environments within gallery settings to call into question what it means to be “natural.” He allows museum visitors to engage with his spaces as they please. It is their interaction with the space that makes the environment “real” or “natural”, since passive observation of any environment defines that environment as cultural artifice. Authorship of Reality (Eliasson): The interactions we have with the world, and the way we engage with a space, are cultural constructs, just as Eliasson’s installations are artificial constructions. Natural environments are also artificial, since the way we sense and view them is through the lens of culturally-constructed senses. What is real is the decisions we make in how we engage with our artificial environments. Authorship of reality lays within the beholder. Culturally Animate Ecology: James Corner’s definition of ecology as something that should be regarded relative to cultural engagement and activity. Ecology should be defined by the interaction between culture and environment. Intimate Immensity: Designing landscapes that facilitate fine-grain, experiential details but also making visitors feel part of something much bigger than them. Landschaft: Landscape as an occupied milieu, the effects and significance of which accrue through tactility, use and engagement over time. Elizabeth Meyer’s Landscape Architecture: Fosters a land ethic and an aesthetic predicated upon a continuum between human nature and nonhuman nature, and upon a recognition that the land is a cultural and physical product and that people are living organisms. Rejects the subject-object relationship of man and nature.